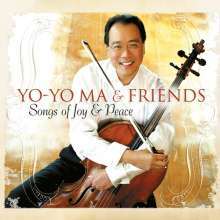 Der Artikel Yo-Yo Ma & Friends - Songs of Joy & Peace (180g) wurde in den Warenkorb gelegt. Künstler: Yo-Yo Ma, Renee Fleming, John Clayton, Diana Krall, Dave Brubeck, James Taylor, Edgar Meyer, Natalie MacMaster, Sergio & Odair Assad, Joshua Redman, Paquito D'Rivera, Chris Botti u. a. Songs of Joy and Peace is a Christmas music album by cellist Yo-Yo Ma, originally released in 2008. The album features collaborations with many other artists, including vocalists Diana Krall & Alison Krauss, James Taylor, Dave Brubeck, Chris Botti a. o. This holiday disc doesn't exclusively stick to traditional Christmas songs, but covers a wide scope of material in a very ambitious manner. Ma opens with a lovely take of the traditional favorite »Dona Nobis Pacem (Give Us Peace)«, playing both the melody and counterpoint via overdubbing. Jazz pianist / vocalist Diana Krall is superb in a swinging rendition of Jerome Kern's unjustly obscure »You Couldn't Be Cuter«, adding bassist John Clayton. An arrangement of »Joy To The World« features pianist Dave Brubeck and cellist Matt Brubeck (his son). Chris Botti has never sounded better in the warm arrangement of »My Favorite Things«, playing both open and muted trumpet. James Taylor is featured on vocals on the Beatles cover »Here Comes The Sun«.